A delicious vegan chick pea salad wrap with avocados, guacamole, lettuce, soy cheese and, of course, chickpeas! 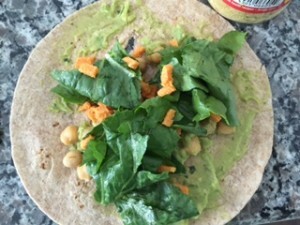 To make this delicious chick pea salad wrap, spread guacamole on wrap, then place the remaining ingredients in wrap, roll up, and enjoy! Best for lunch or a mid-afternoon vegan snack! Delicious chick pea salad wrap!